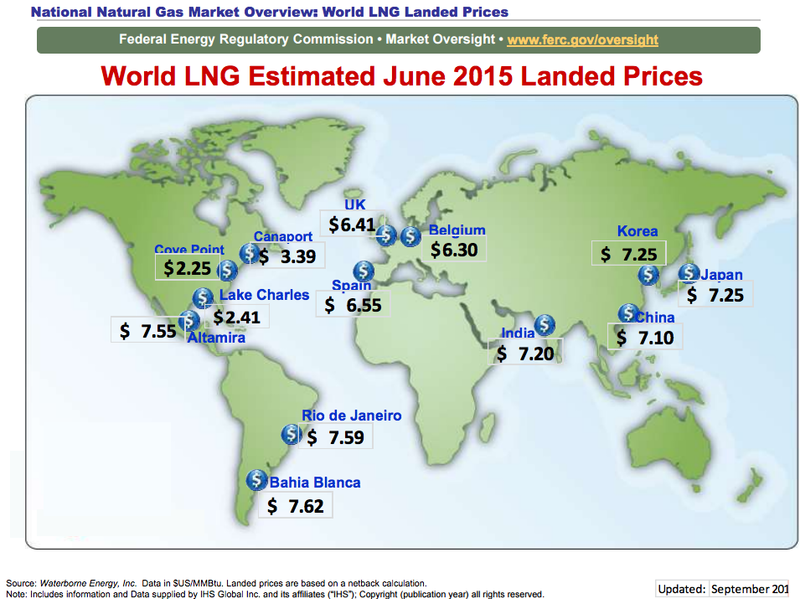 It’s no secret that Cheniere Energy’s chief executive Charif Souki would like to link LNG to global natural gas prices and unlink it to the value of oil. This is a great idea whose time has come. North America’s plentiful shale gas and future LNG Export facilities like Cheniere’s Sabine Pass terminal, Dominion’s Cove Point terminal, Freeport LNG's Freeport terminal plus cross border pipeline facilities to Mexico and Canada will make this a reality. However, I'm not sure that North America's natural gas markets are quite ready and will provide the needed transparency to facilitate this. Fortunately, the solution is not in the hands of FERC and other regulators, but entirely up to LNG export terminal and cross border pipeline facility owners. Transparency is at the heart of any global LNG market no matter whether they are in North America, Europe or Asia. When LNG exports from North America begin in 2016 the fundamental question that most physical natural gas purchasers and sellers (market participants) will be monitoring is how natural gas prices are affected by exports. Specifically traders and market participants need to know how much gas is being exported via LNG terminals and cross border pipeline facilities. Markets thrive on information and unfortunately North American markets provide an imperfect picture of daily natural gas pipeline flows. This was not always the case. Prior to 2011, FERC’s Order 720 required both interstate and intrastate natural gas pipelines to post daily flows of gas receipts and deliveries on their websites. Order 720 allowed market participants to easily see supply, demand, and storage and their impacts on regional and nationwide natural gas prices. In Texas, where intrastate natural gas pipelines are numerous, FERC Order 720 allowed daily observations of 90-95% of Texas storage injections and withdrawals. While Order 720 was very popular with natural gas market participants, the intrastate natural gas pipelines felt like FERC was expanding its jurisdiction. In a court case, in 2011, the Texas Pipeline Association successfully challenged FERC and Order 720 was overturned. So now only interstate natural gas pipelines post daily flows on their websites and only 20% of the Texas storage injections and withdrawals can be observed. Keep in mind that the majority of LNG export terminals and cross border pipeline facilities will be in Texas. The court victory that overturned Order 720 undermines the very transparency needed to make Charif Souki’s dream of a global LNG spot market a reality. This has real implications on LNG terminals like the Freeport LNG terminal currently under construction and to cross border pipeline facilities such as NET Mexico. Both of these facilities will be sourcing their natural gas from intrastate pipelines. With Order 720 out of the picture, natural gas market participants and traders won’t know how much gas is going to facilities like Freeport LNG and NET Mexico since the intrastate natural gas pipelines are not required to post daily flow volumes. Recent LNG landing prices are telling and demonstrate the opportunities to export U.S. natural gas and also the benefits of the North American Shale Gas Revolution abroad. These benefits include less reliance on importer are relatively dirty fossil fuels like fuel oil, diesel and coal and subsequently better air quality in large urban centers in China, India and other developing countries. Europe would benefit from the diversification that a reliable supply of natural gas would supply, plus less reliance on Russian imports in addition to lower prices. In the absence of daily gas flow information postings, many market participants and traders will have to price natural gas and LNG based on estimates of how much gas is actually stored and exported. The Energy Information Administration will eventually publish the export volumes of natural gas several weeks later. However, that information won’t help market participants in the daily markets price natural gas. Also in times of severe weather in Texas and other gas producing states, it will be difficult to determine what's causing gas shortages, i.e. gas exports, well freeze offs or other factors. Finger pointing and speculation will prevail. How much gas or LNG is being exported daily. LNG export and cross border facility owners would simply have to post this information on their websites, where they and other market participants could access it and determine natural gas prices, based on supply and demand. Also the burden on the LNG industry and cross border facilities is minimal. FERC estimated an annual cost of $30,000 on each intrastate natural gas pipeline in Order 720. By providing this degree of transparency voluntarily, all natural gas market participants would benefit. The LNG industry and gas exporters could also avoid being the scape goat every time severe weather or other events affect supply, demand and storage of gas and subsequently cause price spikes in natural gas. FERC Enforcement staff and the Department of Energy would likely welcome a voluntary effort on the part of the LNG industry and gas exporters that promotes natural gas market transparency. In addition, any LNG Futures Contracts that are developed by the IntercontinentalExchange or CME Group would be more likely to succeed since they would reflect the underlying price of physical LNG and natural gas.